This post is pre-scheduled as today I will still be enjoying my writing retreat, where there is no WiFi, TV or ‘outside world’ to intrude. Immersed in story since 18th May – I may never come back! (Well given the choice anyway). My plan for the retreat is to read, edit and revise two manuscripts – The Twesome Loop and Life in Slake Patch and hopefully be able to share them with beta-readers on my return. I may also have added enough story on my newest children’s book – Bubble the Gruggle to send the manuscript to my illustrator, enabling him to begin chapter header images. When I do come back to reality I have two events this week. One an ‘extra’ meeting of the Arts and Culture Council on Wednesday to finalize the Heritage Day event organization and then Thursday I will be co-hosting the senior’s writing group at Silverbirch. So please feel free to share your local writing events in the comments. Join the Writers’ Guild of Alberta to celebrate the 2017 Alberta Literary Shortlisted authors and their nominated works! There will be complimentary wine and food from Aida’s Bistro, time to visit with friends, and a series of lively readings. Free admission. Authors scheduled to read in Calgary include: Lee Kvern, Paige Feureu, Lauralyn Chow, Gisèle Villeneuve, Mary Graham, Rona Altrows, Helen Hajnoczky, Georgia Graham, Laurie McFayden, Ellen Close with Braden Griffiths, Richard Harrison, Shelley Youngblut, and Sydney Sharpe with Don Braid. 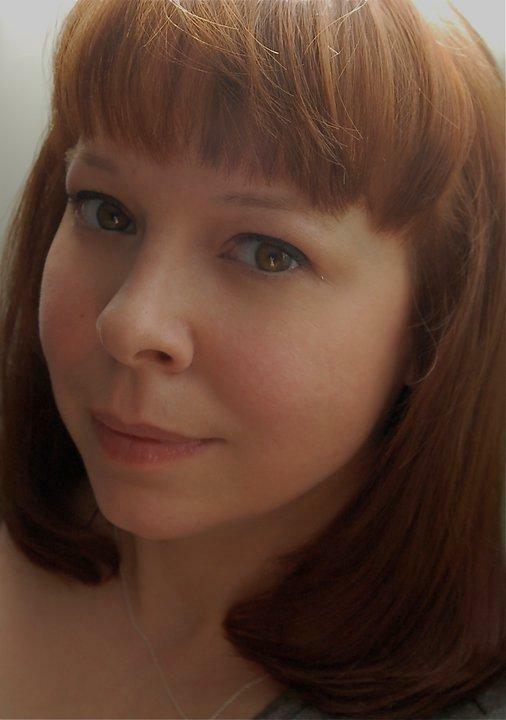 Please welcome Holly, an author and an illustrator. Her images are delightful. It’s relaxing! It’s also a wonderful way to organize thoughts and push ideas. All this can be used to teach, motivate and share knowledge. Writing really does teach you a lot about yourself and lets you get in tune with where your ideas come from. I actually started writing late in my career. I’ve been an illustrator for quite some time but enjoyed mingling text with my work. I decided to take it bit further and put out a book idea in 2008. After being published, I have continued to write articles, blogs and have contributed to several books. It has changed. I initially started writing about creativity, creative business and freelance advice. From there, it has led to me wanting to write children’s books. I illustrated my first children’s book that came out in the Spring so I think this would be a natural transition. Right now I am focusing on children’s publishing and young adult books. I still maintain my blogs and perhaps I will write a follow up to my first book. I definitely do both. When it gets busy, I try to read as many articles as I can. I set them in a file to read over the weekend. As far as books, I have been reading books on writing, creativity and of course children’s books to my youngest daughter. Books are a big part of my household. My kids hands down. They are 24/7 idea generators with more creativity and energy rolled up together that is very inspiring. Working at home is all they have ever known so they are used to me working around them. It can be a delicate balance. So far it’s a bat. It’s a work in progress but I do love the little guy and the positive ideas I am creating around his character. I like a quiet comfy space but I do like the right music to go along with it. It’s a comfy Ikea chair that works well for me. If it’s winter and I’m cold I’ll write in bed with my bedside table. My ideas for stories are random. After that, I plan them out. I like to do the my ideas in point form or just snippets of thought. Lately I have been using my voice memo on my smartphone so I do not lose any ideas when I’m busy or out of the studio. Probably looks like I’m talking to myself at the bus stop but I really don’t want those ideas to slip away. My kids are great for this. Luckily, since I’m an illustrator too there is no end to the ideas. I had to start a notebook to catch it all. Most ideas come from things I read, music lyrics and from writing. Not yet. I plan on joining The Canadian Society of Children’s Authors, Illustrators and Performers (CANSCAIP) to start with and then go from there with local writing groups. I have also contributed to the 2009 Artist’s & Graphic Designer’s Market , 2012 Artist’s & Graphic Designer’s Market , Your Planet Needs You written by Jon Symes and Creatively Self-Employed Written by Kristen Fischer. Also, I’ve contributed articles to How Design & Zero2illo. Margaret Atwood for sure! 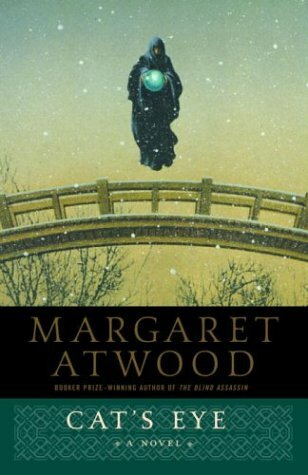 Her book, Cat’s Eye made a had a huge impression on me. This compassionate retrospective about a women’s life felt familiar especially because it’s about an artist. Yes I do. It’s been a work in progress for the past year. 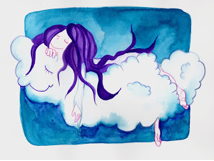 I have 2 children’s book I am working on plus a follow up book about illustration/creativity. I’m also working on a young adult book. 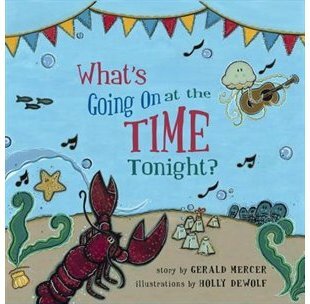 The title of the children’s book I illustrated is What’s Going On At The Time Tonight? published by Nimbus Publishing written by Gerald Mercer. 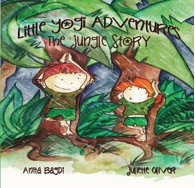 Today’s word is perfect for Juliette Oliver and Anita Bagdi as their book is yoga inspired! 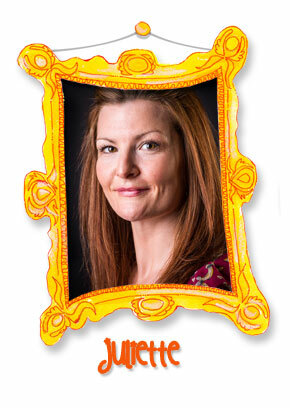 Firstly, here is Juliette’s interview. The freedom to express my creativity through rhyme; whether it be profundity or nonsense, I find my thoughts find some fluidity in rhyme. I enjoyed writing as a teenager and I would definitely say my strongest subject was Literacy. However, I didn’t really begin to write poetry until I was about 26. I remember being very inspired whilst out walking with my children, to write about the seasons. Shortly after, I became a teacher which presented me with many opportunities to write poetry as examples for lessons and also longer pieces as assembly scripts. I feel I write in two styles: predominantly playful and humorous poetry; also, more profound pieces, which are a little more enigmatic. Both. I find time restricts the amount I read for pleasure and I am incessantly inquisitive so I read lots of science! 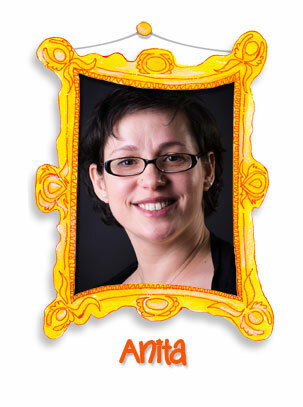 Anita Bagdi – My illustrator and partner in Little Yogi Adventures – we inspire each other and the same level of intense enthusiasm just wouldn’t be there without our synergy. We haven’t so much created characters – we have created stories with the same characters (The Little Yogis) but different themes. Our next theme is The Deep Blue Sea, our current book is The Jungle Story. We wanted to keep the characters generic as The Little Yogis actually represents all the Little people I teach each week – so it could be any of them! The beach or my sofa with a good cup of coffee! Our stories require planning of yoga sequences and planning of a message we would like to convey. Once we have that, then I can compose a poem/rhyme to match the yoga sequence (each posture has a name – the rhyme is written around them). All sounds straight forward but actually they continuously overlap as I swap/change and tweak both wording and physical movement. 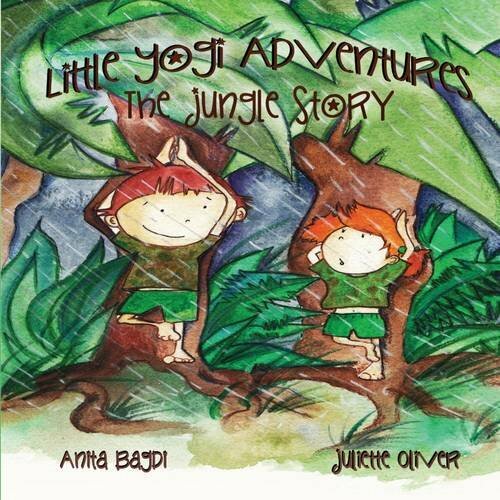 Little Yogi Adventures – The Jungle Story. Well, in an ideal world …..Dr Suess! He is my inspiration as he manages to convey important and profound life messages through humour and rhyme. The ultimate poem being ‘Oh The Places You’ll Go’. My second choice would be Alan Ahlberg as he is also incredibly deft with world play and making the most mundane scenarios humorous. Yes, the next one is written and the yoga has been composed. We just need to get painting! Keep a look out for The Deep Blue. What do you enjoy most about illustrating? I enjoy to let my pencil to spread the ideas onto paper. Sometimes it comes out totally differently as I imagined in my head, as if that pencil had control over my hand! Sometimes it appears much better than I imagined! Sometimes I have it exactly how I pictured. Honestly, that drawing pencil can be a magical tool when it links to a mind! After drafting ideas, I have a go with colours – mainly water colour. That again,gives a different feel to the picture. Maybe some ink or pen to outline bits at the end. Just follow feelings, no learnt structure or routine. My husband catches me smiling while I `m drawing and painting pictures. It’s my kind of meditation. What age did you start drawing and painting? 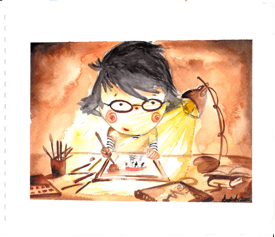 I always dreamed to be an children’s book illustrator, since I was 6 years old. But I have never `learnt any school stuff` about drawing/painting and that actually gave me complete freedom to find my own style. I just love drawing since I can hold a pencil. Has your style changed or stayed the same? As your mind and experiences are changing in your life so are your characters changing. You explore more media, techniques, create new characters, feelings, you learn all the time. Yet, topics can and will change with time, your style somehow will always stays recognizable. Do you have any favorite illustrators who can inspire you? 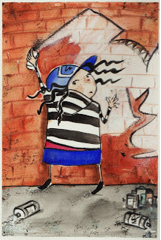 Oliver Jeffers,Emily Gravett, Lynne Chapmann, Corey Godbey, some Hungarian illustrators like Mari Takacs, Katalin Szegedi just to mention a few great ones and I also follow inspiring blogs. My husband – he`s always there for me, if it`s about creating some free time for some art work next to my teaching job or helping to find inspiration or just simply making a good coffee for me…he is a big kid with lots of unusual, fun ideas and real imagination. He is really my `other half`. Also, my friends, their children, the coffee times with them, and the children in my class at school. No mentor, I learn as I go. I like `working` with the Cloud Girls. They already have their stories, all waiting for me to create the pictures to them. I love the colours and the gentle flow of lines on these pictures. Somehow they make you feel, that you also want to be there with that very same cloud. Where is your favorite space to do your art work? 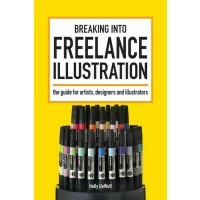 Do you belong to a illustrator/art group? If so which one? Not really, however I follow some inspiring groups like Illustration Friday, Creative Tuesday and try to participate as much as possible. It`s great to share your art with others and also to give and get some feedback on your work. Our first book just came out this summer. It’s an interactive rhyming yoga story for children, Little Yogi Adventures – The Jungle Story. You can order it from our website or straight from http://www.lulu.com. You also can find some useful guidelines of how to use the book on our Facebook page. Oliver Jeffers – love his stories, the life lessons in his stories, his gentle humor in his art. I’m a big fan of his. We are already working on the next Little Yogi Adventure: the Deep Blue Sea. There is another children’s book almost ready and waiting to be published, called Bananas. It`s a charming story of two children who try to find out more about the different kind of bananas. 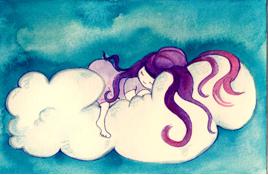 And I have my own characters, the Cloud Girls, whose stories I really would like to paint – this will be a fun project later.